Wow. Obvious it will be a hard battle, head against heart. I. Can. Do. This. I used lemon juice instead of lemon zest (1- 1 1/2 tsp) – add in some lemon or even lime or orange zest as well into the cookie for a citrus-y treat! I used frozen raspberries in the batter since strawberries are in short supply (gasp) but added 1 tsp strawberry essence with the lemon juice – feel free to add any combo of berries! Does that really need icing? So go now and enjoy this Mad Hatter Tea Party, only due to the lack of chocolate. I guess after writing this post and fighting my conscience with an imaginary light saber/wand/whatever I want, I truly believe this weekend did deliver some decadent treats! Yum those mini bundt cakes look delicious! Just to let you know I baked the cookies – I called them Jewel Cookies because they look so beautiful with the Craisins in them! I’ve posted photos too and put a link to you but since I’m quite new to this blogging game, I’m not sure if you will be notified. Feel free to use the photo of mt Jewel Cookies. I love the post and your awesome slideshow! And thank you so much for being so supportive of the recipe! I’ve had more ‘likes’ for this page than any so far in my blog, thanks to you and your recipe! PS Did my link come through to you? And I am glad you enjoyed this recipe my friend – it was truly wonderful to see your pics! Hehe, I love your stories… You especially had me with, “my melts resting comfortably away in their pantry instead of screaming and running amuck like usual…” I’m very intrigued by these polenta cookies. Have never seen something quite like them. Hello, I’vejustmade the polenta cookies but they are waiting overnight to be baked. Can you feel my impatience? The raw cookie dough tastes good though. I had run out of polenta so used semolina and had no golden raisins (I guess these are our sultanas) so I’ve used Craisins which are cranberry raisins. I’ll let you know how they turn out! Thank you for a delightful blog! I love your substitutions and craisins are one of the best snacks ever! And I feel for you, the waiting is the worst!!! I’ll be baking them today and I do take pictures of processes and finished products so I’ll send you one. Thank you for your interest. You might like this site, some fabulous Brownies on here and I read that you’re searching out the best one! Bet they will be perfect! Thank you for coming by and for commenting… so glad I dropped by they look amazing! These beauties would brighten anyone’s day! I they certainly did mine! I like both mini or large Bundts, but either way this dessert is a beauty! Looks delicious and since I don bake dessert often, I’m envious you made more than just one kinds! 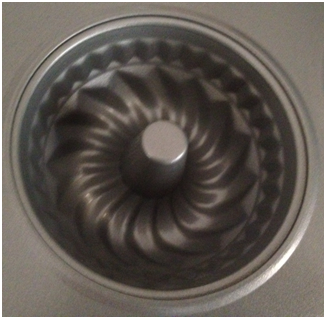 Thank you so much – I too love Bundt shape in general! 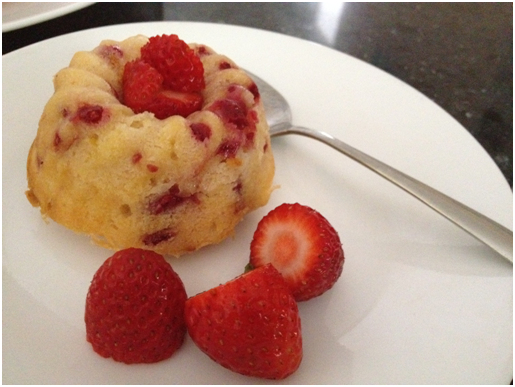 love little cakes and with raspberries even better! I like how you deal with things by eating a Lindor ball LOL! I love the sound of those polenta cookies and love how both baked goods came out with the lovliest light golden color. So pretty! Who needs chocolate when you can have delicious treats like this??? The clicks make me drool here.loved the colour n tatsy too……. urmm urmm… I really want to eat this now…. lol. 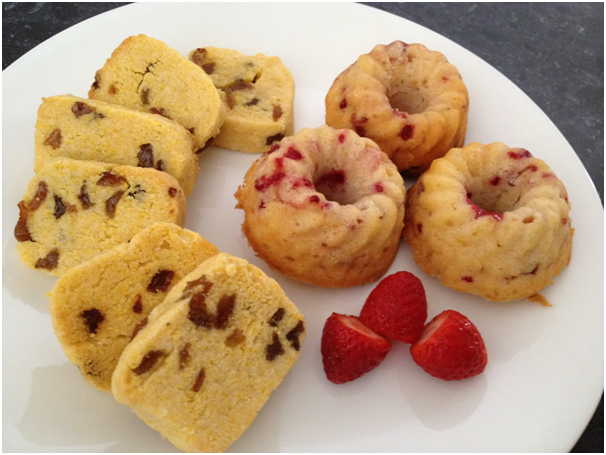 Mini bundt cakes and cookies!! What a wonderful weekend you had!! YUM! They both look and sound delicious. OMGoodness Girl! Now I need to run (not walk) out and get one of those mini bundt pans!!! They are so pretty and delicious looking…and the yogurt…sigh, lovely…your writing is tons of fun. I love the reference to my precious…makes me giggle every time I hear it..makes my eyes go big and my hands start to quiver. Also…finally figured out my posting problem…it was the browser I was using! AHA! No chocolate? Are you feeling all right? Seriously, those mini-bundts are beautiful! 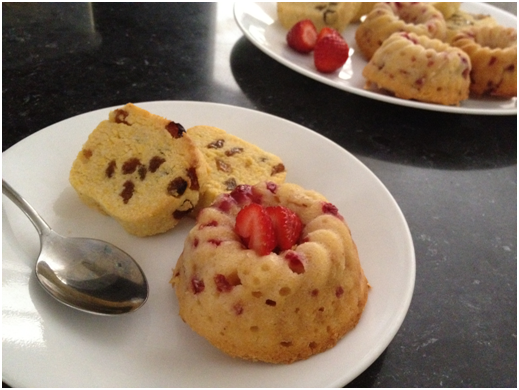 The Tropical Citrus Berry Yoghurt Mini Bundt Cakes look so adorable! I want one! 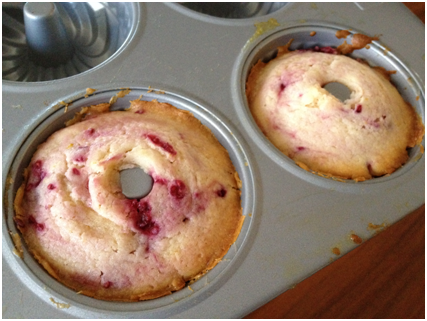 The mini bundt tins look gorgeous as do those cakes! Polenta cookies!!! A whole new revelation, v cool!!! 🙂 I love Lindt balls too!!! And you go girl – anyone who likes Lindt balls is my friend! Omgosh, these lemon polenta cookies – I’m working with golden raisins right now so I must try these this week! Great post – thanks!! 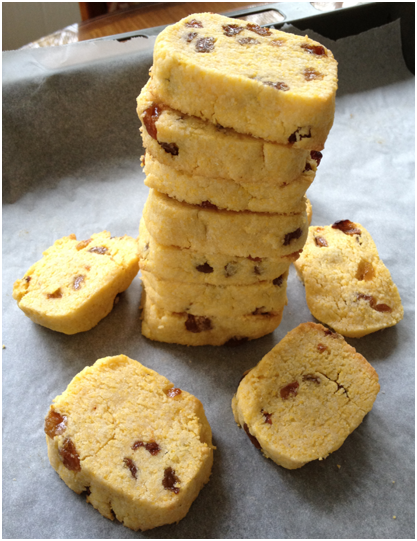 And definitely with or without a delicious supply of raisins, polenta cookies are a must make! Both looks lovely, love the texture too. Would be perfect for afternoon tea. And you are definitely right – a perfect afternoon tea! I especially love the mini bundts. They look soooooooooooooooo cute and delicious!! Who needs chocolate when you´ve got gorgeous cookies like these! mini bundts are definitely one of the most adorable treats ever. both of these creations are magnificent! Yummm! 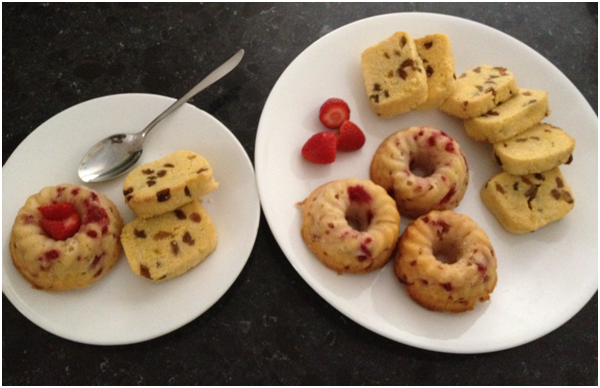 I absolutely adore the mini bundt pans too! I, for one, am glad you’ve left off chocolate… if only because of the cravings and anguish you’ve given me.. longing to have a bite of your creations;) Having said that.. these are sooo pretty and springy and lovely too!! And I’d love to have these on my ktichen counter as well!! Very funny! I think Chocolate needs to be snubbed sometimes, just so it doesn’t think it’s the center of the universe! Everything looks delicious, even though they weren’t chocolatey 🙂 Love the idea of using polenta in desserts! Hah! I’m a little bit of a chocoholic myself… it’s hard to gear up to make a dessert that doesn’t have it – because it is so necessary. I hope you get back on the chocolate train again soon – though both of these look very good (even without chocolate). these look delicious – and adorable! These Bundt cake look so so adorable!! And the cookies…They sound absolutely yum…. You know after seeing these, I am so craving a beautiful tea party…. The bundt cakes are so cute, and looks delicious too! You have outdone yourself my dear friend!! Two lovely recipes and both are stunning. I have never tried polenta… especially in baked goods. What a great idea. Now the mini bundts make me just want to jump through the screen and eat one. I love your little bundt pan too. 🙂 What a wonderfully “mad” weekend indeed!! These treats are so cute and look so perfect for a spring tea party! Holy nom nom. Check you out showing off your skills, lol. You made me laugh too with the calm down, eat a Lindor ball. I LOVE those, yum. Have you ever made Malt Loaf? Looks like you’d be good at it. I love malt loaf too. Just a FYI.. I’m on my iMac at the moment so I can view your website properly but I do a lot of commenting from my iPad at night in bed (lol) and for some unknown reason, your blog doesn’t render properly on it. I can’t read anything 😦 Just thought you should know. Yes, I have cookies, etc accepted on my iPad. I’m a techie person so I knew that one straight away. In fact, when you get this comment, please directly email me back and I’ll reply to you with a screen shot from my iPad so you know how it shows. 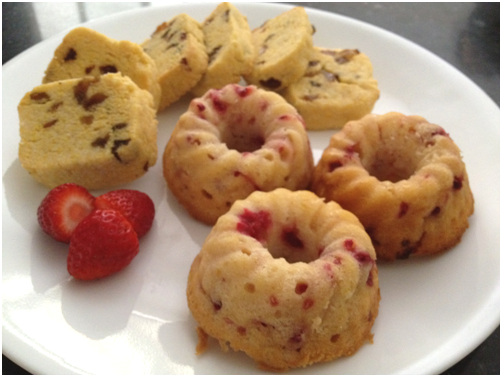 Adorable mini bundt cakes! So cute. You are correct, no frosting needed! And you do not have to be a doormouse – you are defiinitely invited! Both are so tempting and really cute! I love that square shaped cookies made with polenta. Thanks so much for the wishes dear…. Normally I’m more attracted to cake-like things, but just the thought of those polenta cookies… mmmm! LOL! Your obsession with chocolate is amazing!! I love it! And I promise you will enjoy them on trying them! These look great. As much as we both love chocolate, I frequently feel like a lighter, buttery, fruit dessert. Those desserts look so yummy! I’ve never made anything with polenta–I’ll have to try that! And I definitely recommend polenta! I love how you described the Polenta Cookies as little Discs of Sunshine – you have me craving both of these with my cup of green tea this morning – I can almost taste them through my screen! how cool that u used polenta. Its so verstaile isnt it? Love your creation, its refreshing! 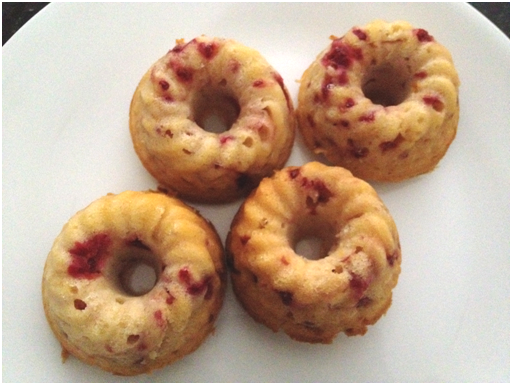 Cute mini bundt cakes .. I always love things small and petite…. These polenta cookies look so lovely and melt-in-mouth delicious! And I am very happy you enjoyed the cookies – thank you very much! No chocolate! Gasp!!! JK Looks delicious! I have the same minibundt pan! Polenta cookies?! Really!! Wow! That must be tried I say. And I got them at a specialty houseware shop but I am sure you can buy them on amazon or online – just type in mini bundt tins and happy shopping! this is mine!!! mine!!! oh my… when i watched it the first time, I got so freaked out by it!! xD but these cakes are a beaute! seriously! I’d try to keep my paws off the screen! When I was little and watched it gollum was a nightmare – now he is cool! thanks for stopping by my blog and funny that we both had some crazy weekends producing sweets :-). especially those mini-bunt cakes look soooo adorable (why is it that we coo over everything small?) and i didn’t even know that you could make cakes with polenta, definitely worth giving it a try! I love reading your posts, you have a way with words my friend. They both look amazing to me! Chocolate or no chocolate, these look wonderful!!!!! My dear CCU, I wish you could see my huge smile and hear my continuous laughter when I read your blog posts. You are so clever with words and ideas. Both recipes seems scrumptious. The first looks like a version of a shortbread cookie and if it’s crumbly, it’s even more like shortbread. The second may lead me astray because of the Greek yogurt. What brands of Greek yogurt do you have available? My very favorite is Oikos Plain Greek Yogurt. Thank you again for your wisdom and humor. Always a pleasure to read you. I appreciate you a lot! hahah ok even without the chocolate these look ah-mazing! Love the polenta cookie idea, I’m pretty much obsessed with any kind of lemon dessert right now so these are absolutely perfect for me 🙂 I think it must be that summer’s coming that all of the fruit desserts are looking so good! Lovely looking treats for spring. I would come to your tea party anytime! And you are more than invited! I still haven’t made something sweet with polenta, I know, I know. I need to get on the ball. These look great. Yum! Both desserts look fantastic and delicious. Drooling! Chocolate is certainly not a requirement when it comes to enjoying baked goods! Polenta is an ingredient I need to start working with. Both of these look tasty, so deciding on one would not be an option. Thanks for sharing these links-well done! yay for polenta in cookies! and for little baby bundt cakes. oh these are all so cute!!! You sure did have a mad weekend!! 🙂 I have to make the Lemon Polenta Golden Raisin Cookies!! Love the combination of all of those ingredients. I have never had polenta in a cookie…love the idea. I’ve been thinking about trying cornmeal in cookies. 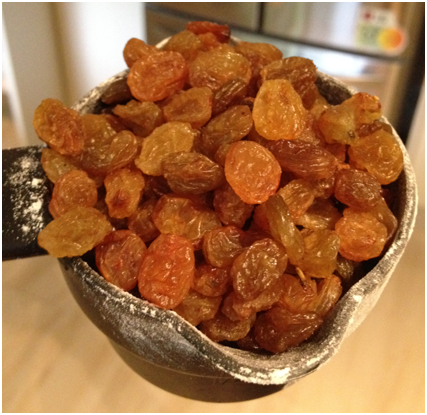 Yours look delicious, and my boyfriend would no doubt love them (he has a strange passion for raisins). …You can make cookies out of polenta!!!??? And you will love them! very eager 2 try this.looks just yumm.kids will enjoy this surely…. I am sure you and your family will enjoy these! These both look delicious–especially those polenta cakes! I’ve never baked with polenta before but I do love adding cornmeal to cookies and biscotti and such! If you like polenta in one dessert you will love it in all I promise! First, congratulations on your recent awards — very well deserved! Second, I loved your post on your brother. Sibling relationships are the icing on the cake of life (chocolate, of course.) 🙂 And third, even when you deviate away from your chocolate obsession/passion/undying need (which I can truly relate to…), you come up with delectable, mouthwatering recipes! These two do indeed advertise all of Spring’s merits (even though you’re in Autumn there, as you mentioned.) It’s a pleasure to read your posts! Your metaphor is lovely and very true – siblings rock! 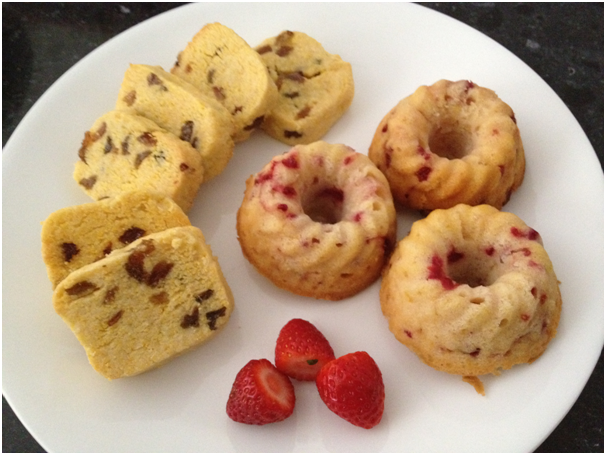 Love the mini bundt cakes!!! I feel some spring baking coming this afternoon! I have been having issues posting comments on your blog for the pass few days. Looks like its solve for I need to log in with wordpress account from now on. I am taken in by these cookies you made and they are sure a good change compared to all the choc desserts you have been sharing. You know I am not really into chocs, so I am loving looking at the pics of these cookies here. I agree, change (occassional!) is good and I am sure these would suit a not-so-choccy lover like you – enjoy my friend! These are just Adorable things. I love to eat them. But can I tell you a secret – they were actually meant to be round but I could not get that shape – good to know they look alright though! And yep, definitely love me some polenta! And thanks for the foodbuzzing support! Okay…so it’s hard for me to imagine a chocolate-free dessert but these? These look phenomenal. I love all things lemon! And I’ll take LOTS of these! YUMMY CCU! I love how inventive you are with your baking. And your excitement is contagious! Great job! I am so glad you enjoyed them!!! Besides my wooden spoon, it is a new favourite! And thank you my friend, they are like baby cakes! The mini-cakes are adorable. Hard to go wrong with raspberries. 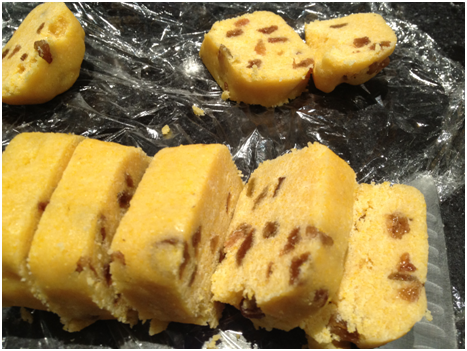 Just keep those raisins out of my lemon polenta shortbread! You could put almonds in them, or hazelnuts, or more coconut if you are baking for me. Love them, both of them. I tend to include chocolate in just about everything but IMHO these are perfect just the way they are. 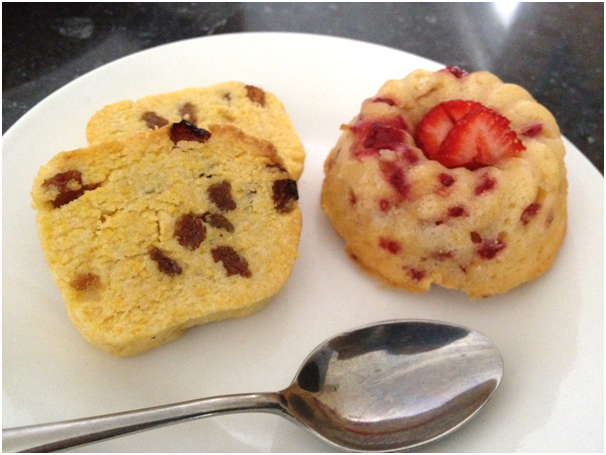 Love the polenta and raisin, oh, and the baby bundt’s are too cute. And thank you my friend – I am glad you enjoyed them! Great recipes! I love both but my favorite is the cookie recipe! They look so so yummy! The cookies were yum so I hope you enjoy them! I like your calming philosophy/process haha! And both of those look gorgeous.